Villa rurale située à 4 km de la plage, dans la périphérie de Pollensa. Cette grande villa spacieuse est située dans le quartier résidentiel de La Font, à proximité de la route à Puerto Pollensa. hébergement spacieux et confortable sur deux niveaux. terrasses ouvertes et couvertes, barbecue, sauna et jacuzzi. Rez de chaussée: salon / salle à manger avec cheminée et portes à la terrasse avant, qui se prolonge sur toute la longueur de la villa. Cuisine avec sortie sur terrasse, 1 chambre double avec salle de douche attenante. Premier étage: 2 chambres doubles, 2 chambres doubles, deux de ces chambres ont des portes donnant sur la terrasse de côté, 2 salles de bains. À côté de la piscine et le jacuzzi il y a une autre salle de bains et un sauna. Villa est situé à moins d'un kilomètre du centre-ville. Nice 10 minutes à pied de la villa à la ville de Pollença. We were a family of 6 (3 adults and 3 children) and we had a very enjoyable week in Paco's place in Pollenca in October 2018. Paco was a very friendly host and we felt very welcomed in his house. He was very communicative, and while he was away in Madrid his son Ignacio came by to sort out the heating of the jacuzzi (see below). The house and grounds are very beautiful and we had gorgeous weather for our entire stay. We would come back again. The house has large grounds and our 7 and 4 year old boys enjoyed playing football on the lawn, looking at the frogs in the pond, and exploring the various fruit trees. They were far too weak willed for the pool (which was also considered to be quite cold by the adults too), but loved the jacuzzi / hot tub (but NB we needed to pay EUR 200 in heating costs - it would be worth being aware of this in advance). The sauna was a real bonus. We had to buy basics for the property (washing up liquid, toilet roll, hand soap, cooking oil etc.) that in other places are often provided, but there was a Lidl just up the road for everything we needed. The only other issue during our stay was that there seemed to be lot of mosquitos in the area and we all had quite a few bites on us (despite the repellent) by the end of the stay. The area is gorgeous, with great beaches for swimming (the Med was quite a lot warmer than the pool) sailing, cycling, walking, and nice restaurants. We had a lovely stay and would come back. Die rustikale Finca liegt in einem ruhigen Wohngebiet. Das Zebzrum von Pollença ist in ca. 20 Minuten zu Fuß zu erreichen. Die Finca selbst ist in einem gepflegten Zustand. Besonders hat uns allerdings die überdachte Terrasse und vor allem der Poolbereich gefallen. Das Poolhaus bietet neben Dusche, WC und Solarium eine Bar und einen großen überdachten Sitzplatz. Samstags wird Grundreinigung innen und außen gehalten einschließlich frischer Bettwäsche und Handtücher (nur Strandtücher werden nicht gestellt). Vermieter Paco ist großartig! Sehr freundlich und hilfsbereit. Das Haus ist schön und entspricht den Bilder. Der Außenbereich mit dem Pool, Whirlpool und der Bar (mit Kühlschrank) im Poolhaus sind perfekt für entspannte Tage. Die Sauna und das Poolhaus sind ebenfalls sehr gut. Die Ausstattung der Küche ist gut und ausreichend für das Haus. Die Geschirrspülmaschine hat zwischendrin mal nicht funktioniert, aber Paco hat sich schnell darum gekümmert und ein Mechaniker kam und hat alles repariert. Sehr guter Service. Die Bäder sind in Ordnung, aber schon etwas in die Jahre gekommen. Internet und Fernsehen funktionieren gut. Die Übergabe des Hauses war super und unkompliziert. Paco ist sehr nett, spricht englisch und ist sehr gut per WhatsApp und Telefon zu erreichen. Just returned from a week here. There were 9 of us from 1years old to great grandparents in their 70s. The villa is well equipped and comfortable with plenty of space for everyone. We spent most of our time in the pool area which is lovely. The covered area is perfect for a quiet cup of tea in the morning while everyone’s still asleep as well as providing much needed shade in the afternoon for relaxing between playing in the pools. Pollença town is minutes away and the port and Alcudia are only a short drive. All are worth a visit. 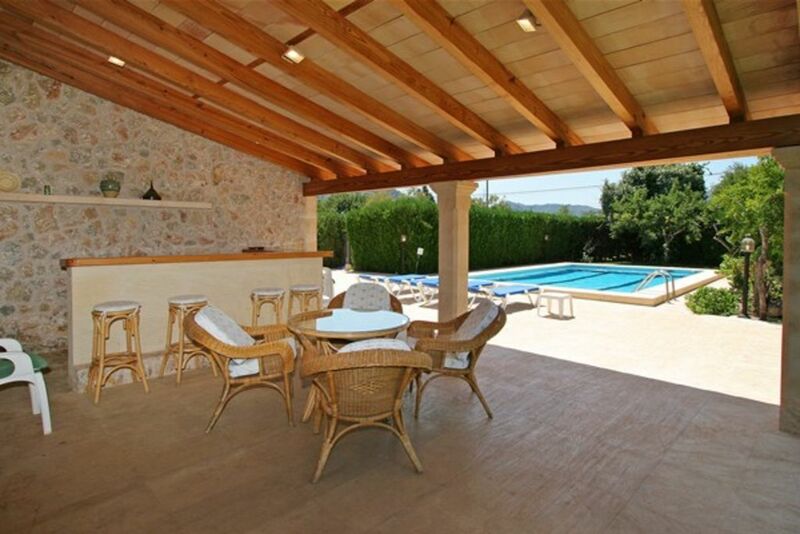 All in all a lovely villa, well located and perfect for families. This house is located fifteen minutes walk from the town so it is fantastic if we went to have dinner and we could drink a little wine. Very quiet house, very close to the town where you can go walking. It is ideal for a vacation. vieille ville Pollensa avec des restaurants sur de nombreuses jolies places, magasins, supermarchés et autres commodités à une distance de moins de 1 km, et seulement 10 minutes en voiture de plusieurs plages de sable blanc, où vous pourrez déguster toutes sortes de sports nautiques. En outre, le nord de Majorque est entouré par la belle chaîne de montagnes Tramuntana et de nombreuses petites baies sont également présents.